The first time I had Hi-Chew, the texture really surprised me. I think I was expecting something less...elastic? Anyhow, once you know what to expect, these are typically fantastic candies with great flavors. The one flavor I tried and didn't like was Watermelon, because it tasted like cucumber. But that's another story. The packaging here is quite eye-catching and very psychedelic. I'm not sure why they went with such a groovy theme, as pineapple doesn't really make me think of disco and roller skates, but it's attractive nonetheless. 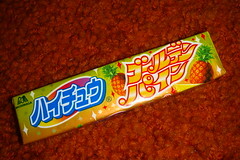 Morinaga is generally spot on with fruit flavors, and they nailed pineapple. These were incredibly juicy and sweet without being overly so, and thanks to the unique texture of Hi-Chew, they don't get stuck in your teeth. Did I mention the candy also smells great? Pineapple is one of my favorite fruits, so it was nice to have it so well done here. I love, love, loved this one. I also recently picked up the Golden Kiwi and Aloe Yogurt and am not as pleased with those. I saw the Aloe Yogurt one in the store and bought this one instead. Now I'm even happier that I did! We only get the regular variants of Hi-Chew here in the Philippines. I love it for its "elastic" properties. You can really chew it for a long time! I don't get to buy Hi-Chew much because it is quite expensive for candy. It's about $1 USD here, whereas you can get the Van Melle Fruit Tella for half that.